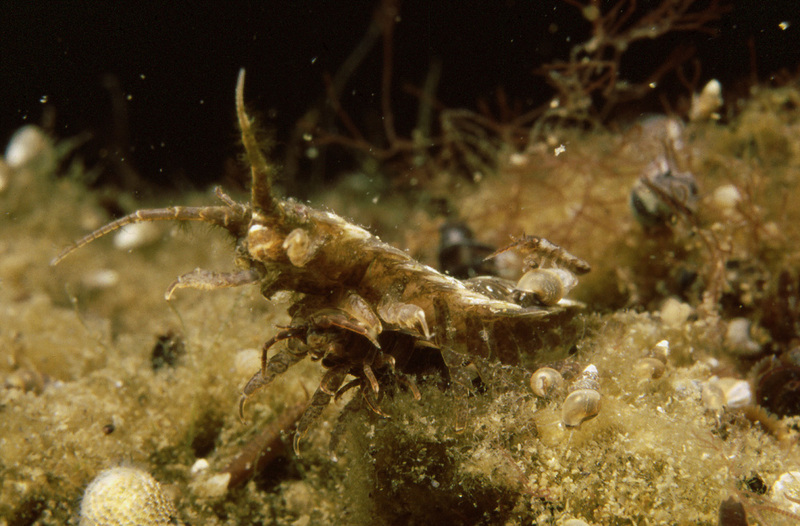 The Baltic sea is notoriously poor in species diversity, the brackishness being the main cause of it. 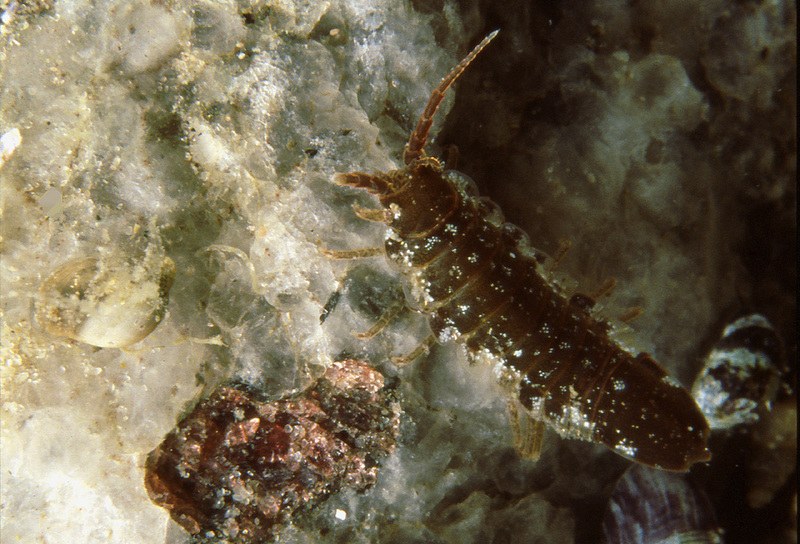 It is also geologically young and far away from other sea areas inhabited by species adjusted to similar salinity. 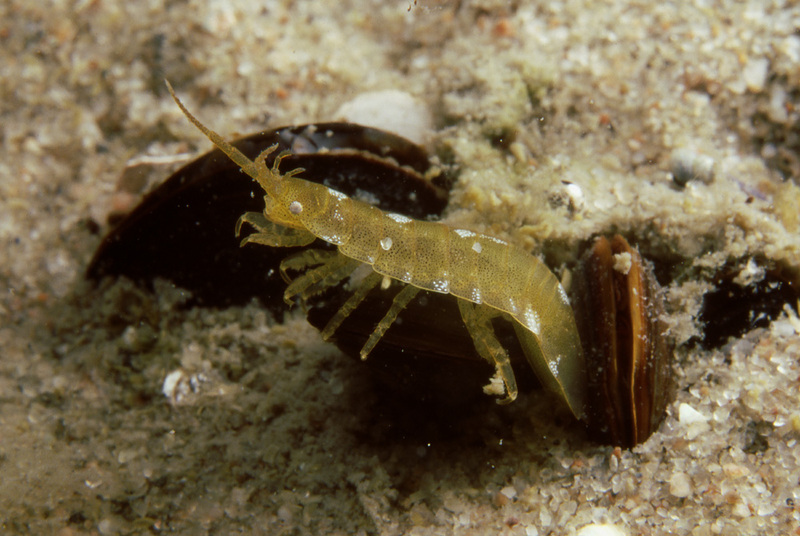 Even with the narrow connection to the North Sea and short lifespan of the Baltic, the species living close to it have already had enough time and opportunities to move in, had they been capable of it, so newcomers from the surrounding seas are no longer expected. 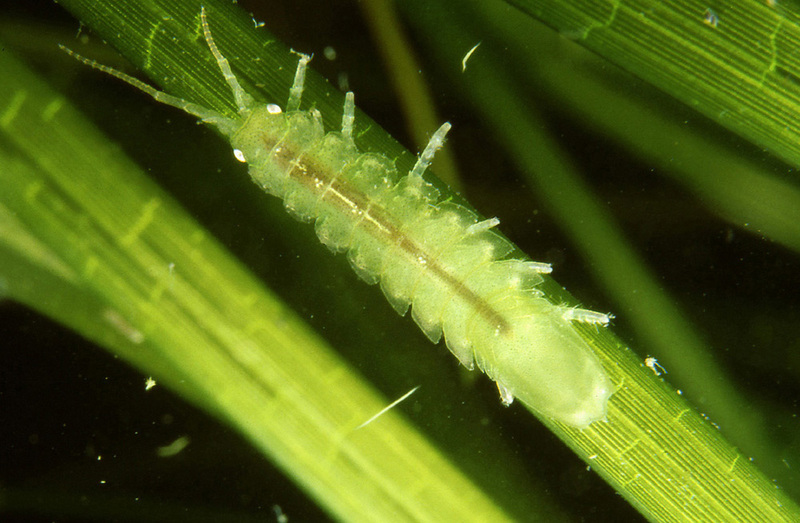 Idotea baltica or the smooth seaweed isopod is a species that illustrates well the life of some of the immigrants: an almost cosmopolitan species of little environmental consequence in the oceans, when spreading into the Baltic, changes into a dominant grazer of the algae. 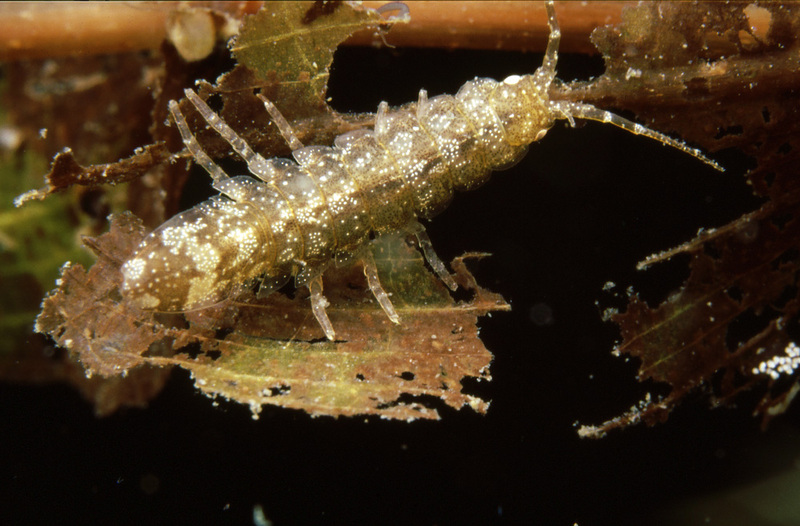 Having adjusted to the more demanding living conditions of the brackish and cold water the Idotea baltica has received a reward of unexpected proportions. 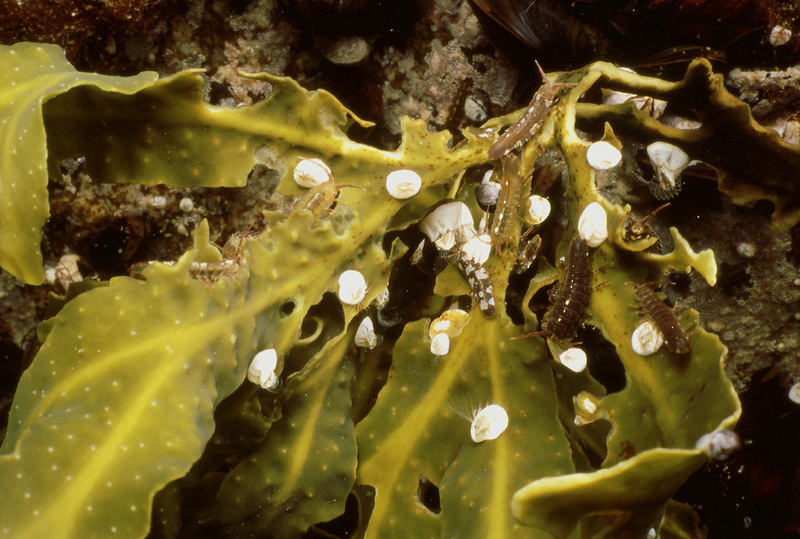 There are other examples of such dominant newcomers in the Baltic, as we already saw in the case of the bladder wrack and the blue mussel. So, the number of species in the Baltic may be low but it doesn’t necessarily mean that the number of specimens would also have to be low. In fact, many of the immigrant species thrive in the Baltic in a way they would never do in the more intense interspecies competition of the oceans. 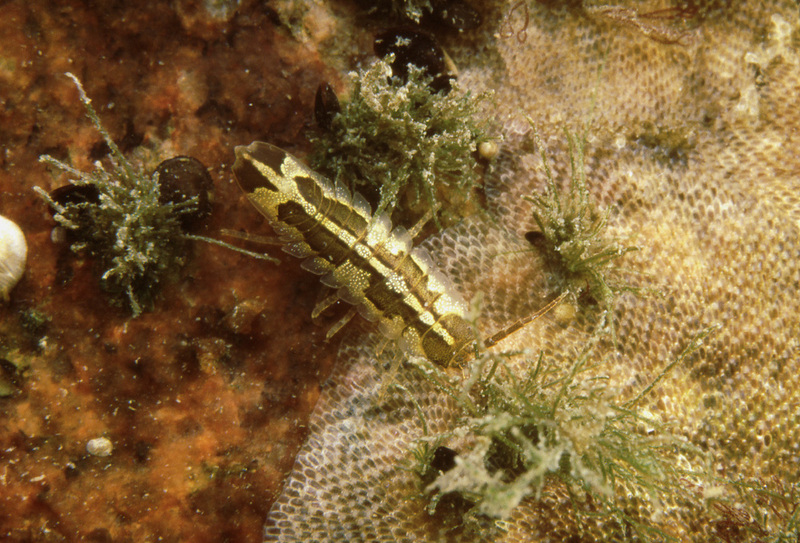 The smooth seaweed isopod, however, has a unique characteristic, which the other species don’t have: its striking color variation. The variation is a combination of patterns of genetic origin and basic color, which in turn is a result of at least the type of nutrition and surroundings where an individual lives. In addition the relative abundance of the colorations vary with time of season and between the sexes but, on average, they stay more or less the same from year to year. 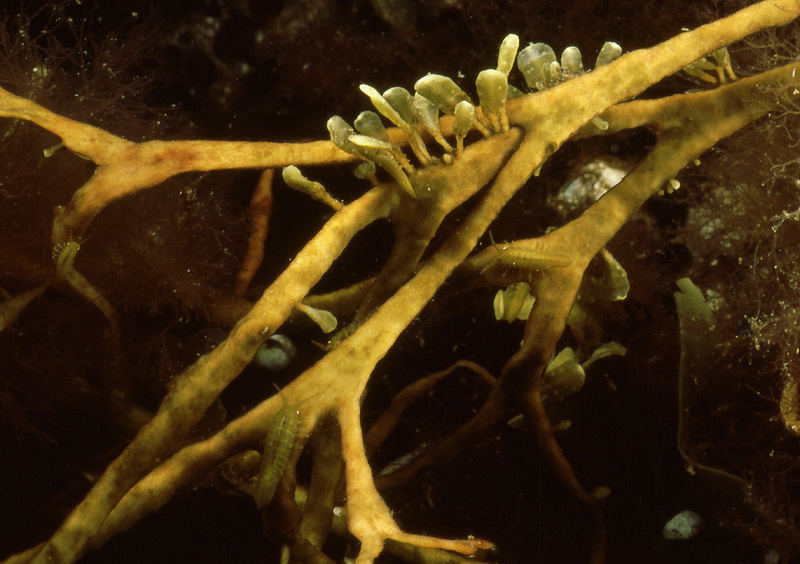 By itself Idotea baltica is hardly a grazer that could diminish the bladder wrack in a way that has been seen from time to time recently. 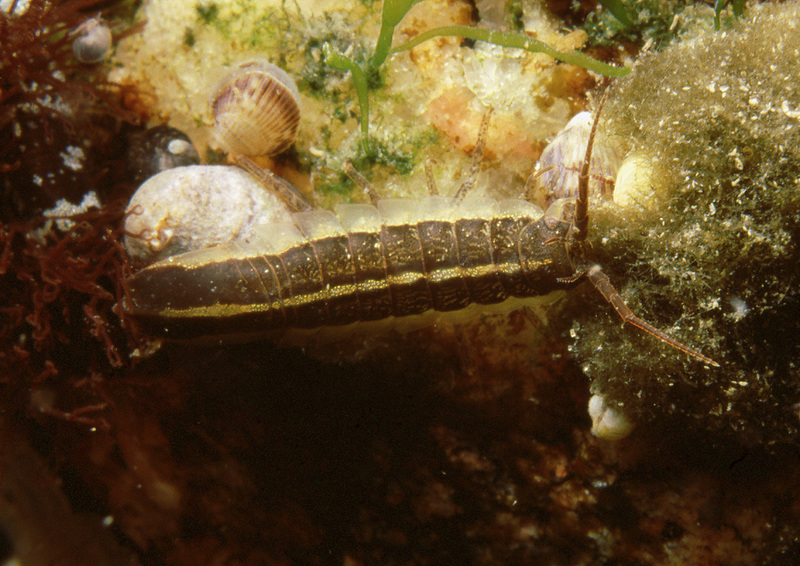 The eutrofication, however, does seem to have the double effect of making the wrack weaker and the isopod more abundant. 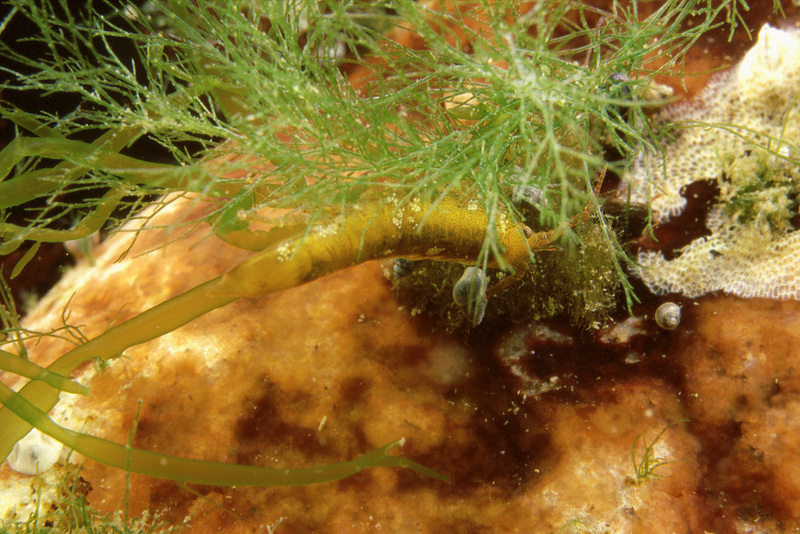 This is thought to be the result of increased growth of filamentous algae: the algae are a stress for the wrack and, at the same time, offer the juveniles of the Idotea improved living conditions. 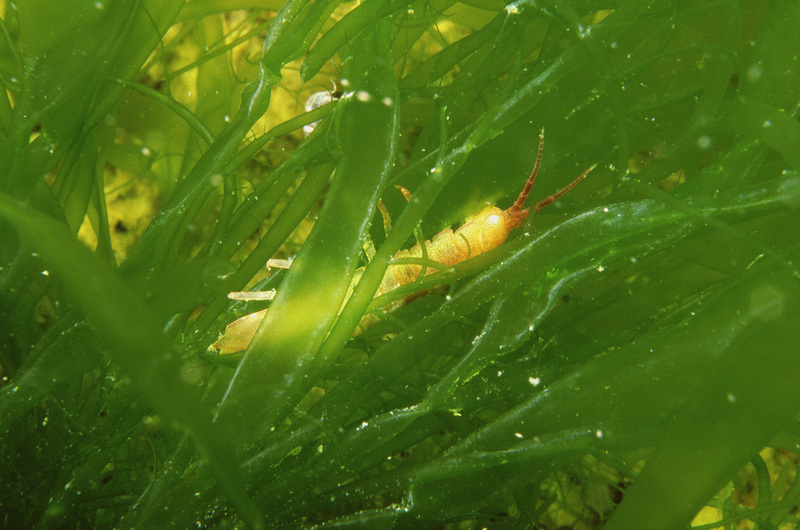 These idoteas are not exactly juvenile anymore but the photos do illustrate the kind of environment that the filamentous algae offer to the young living in them. 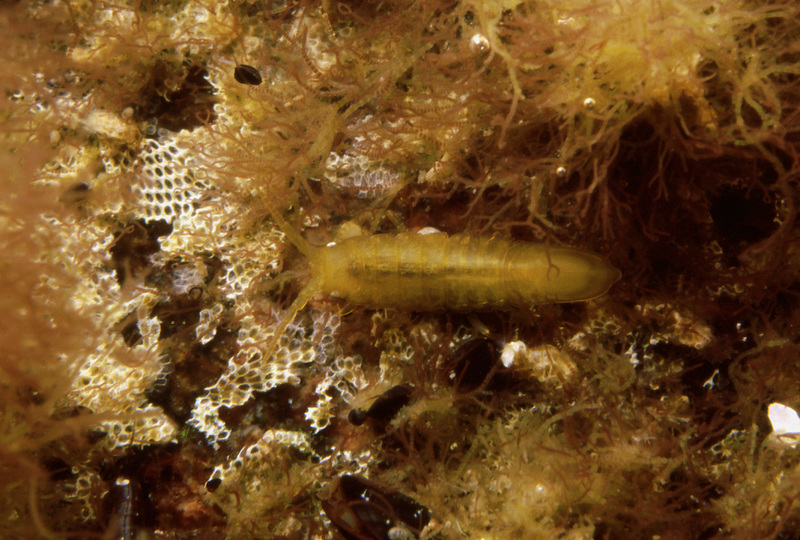 The entoromorphas and cladophoras are some of the typical algal species. 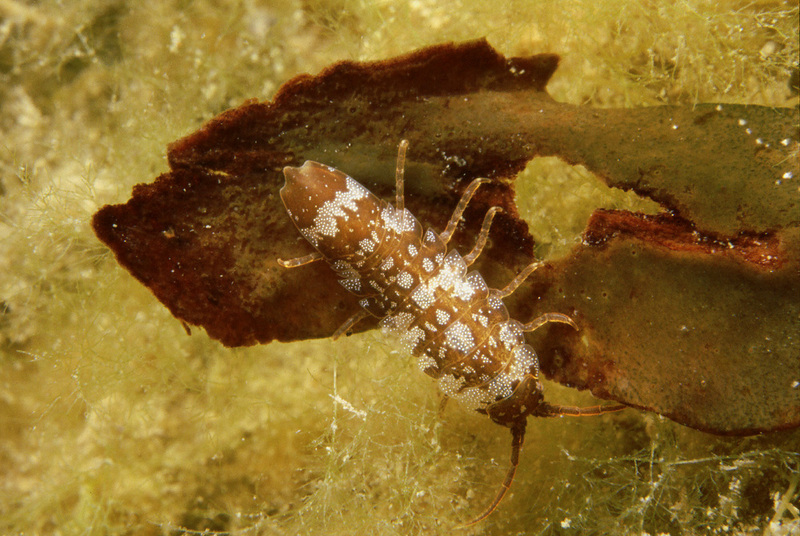 Being as abundant as they are the smooth seaweed isopods can be seen in just about any kind of environment, not just on filamentous algae while young or bladder wrack when fully grown. 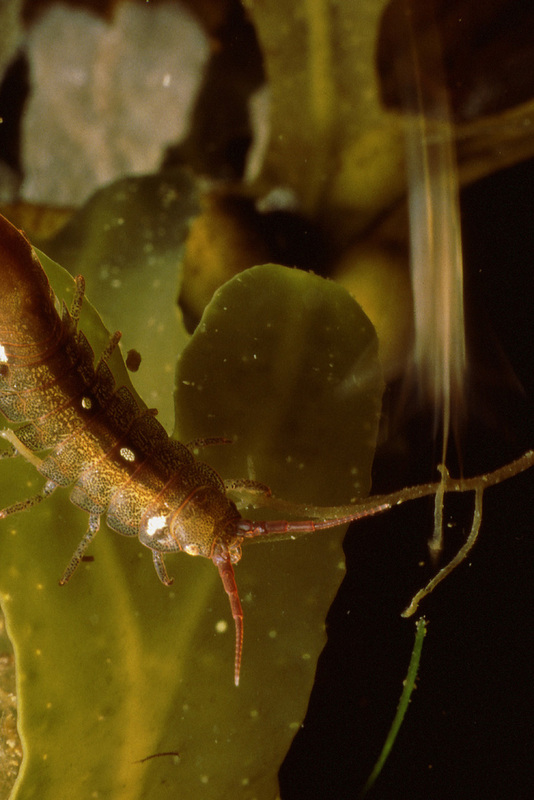 Swimming is a risk for the Idotea but sometimes it’s just necessary to make a move; say, from the smaller plants to the bladder wrack environment. Three of the five basic patterns of genetic origin: one-color, finely spotted, and coarsely spotted. Two of the striped variations. It's thought that the Idotea does not seek an environment suitable for its coloration actively: rather, it’s the predation that determines the distribution we observe. 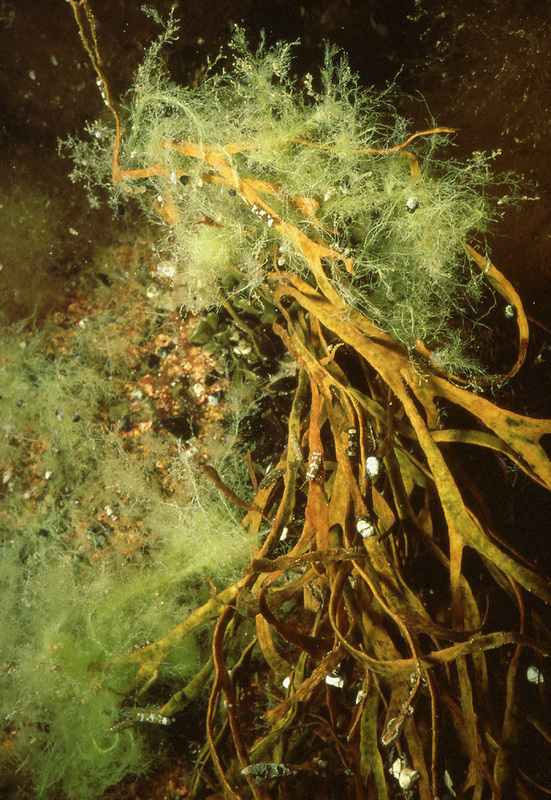 The upper parts of the wrack, for example, are typically more monochromatic for lack of sessile growth and will favor also Idoteas of one color. 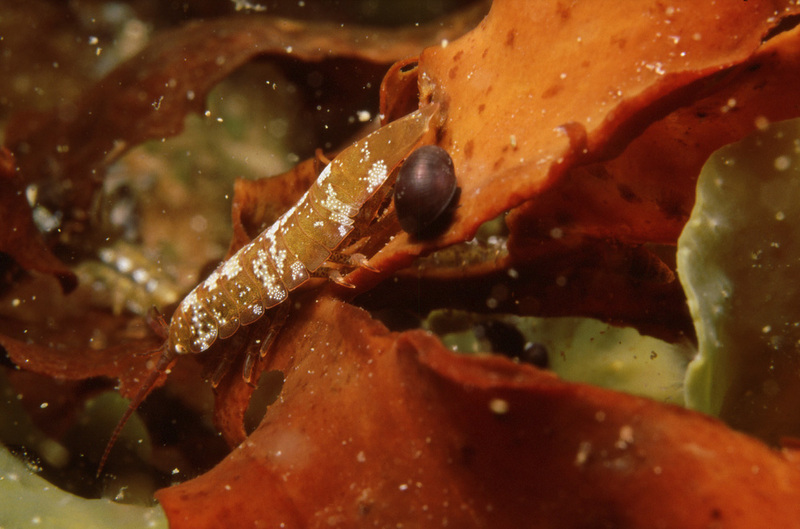 The final touch of the camouflage, though, does come from the Idotea: it’s capable of changing its colors at will using the chromatophores, or color cells. The feeding preferences of the idoteas have been subject to some controversy. 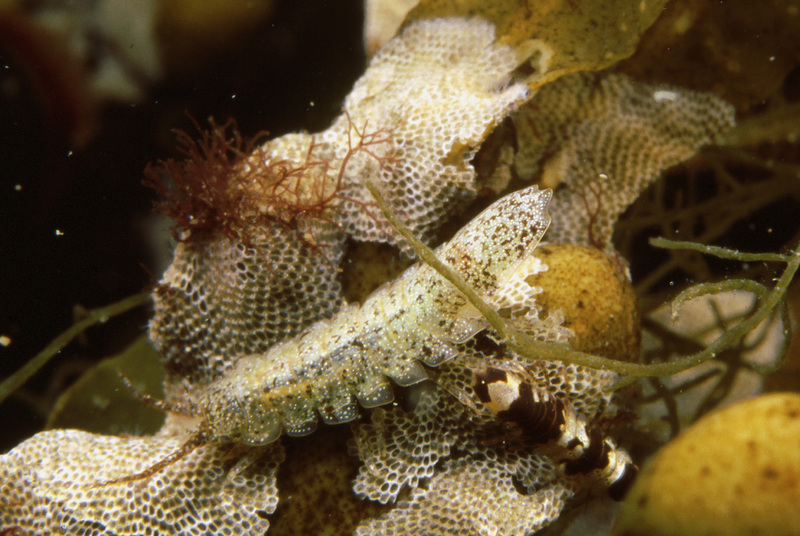 It is now thought that these animals prefer the upper and younger parts of the bladder wrack as their food but that for reasons of better protection the lower parts of the wrack tend to be eaten first. Whatever the order, the wracks can look pretty miserable after the idoteas are done with feeding. 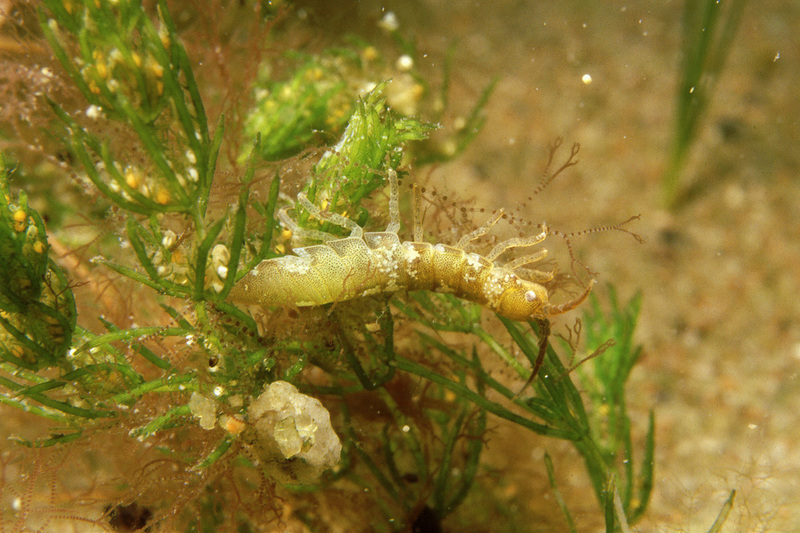 Idotea baltica is by far the most abundant of its genus in the Finnish coastal waters but there are two other species as well. 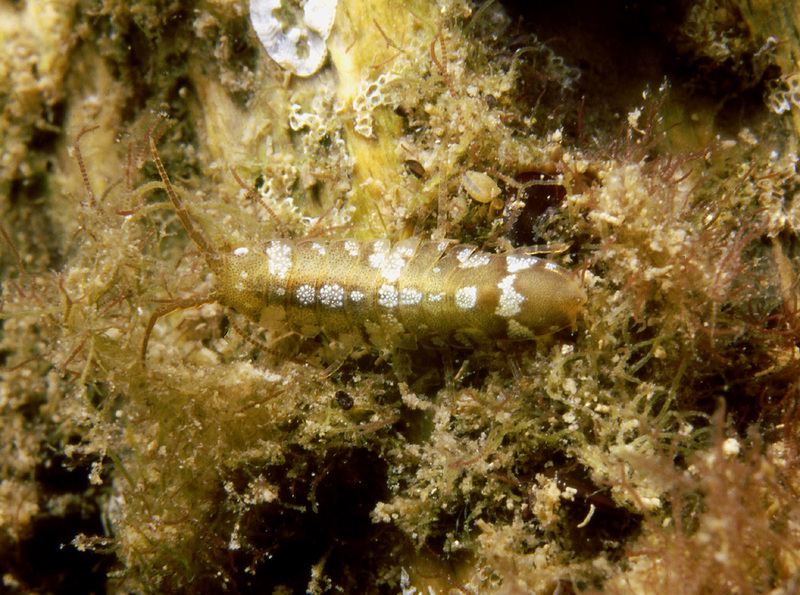 Idotea granulosa frequents the more open shores where the sessile growth is weaker than in the more protected areas. 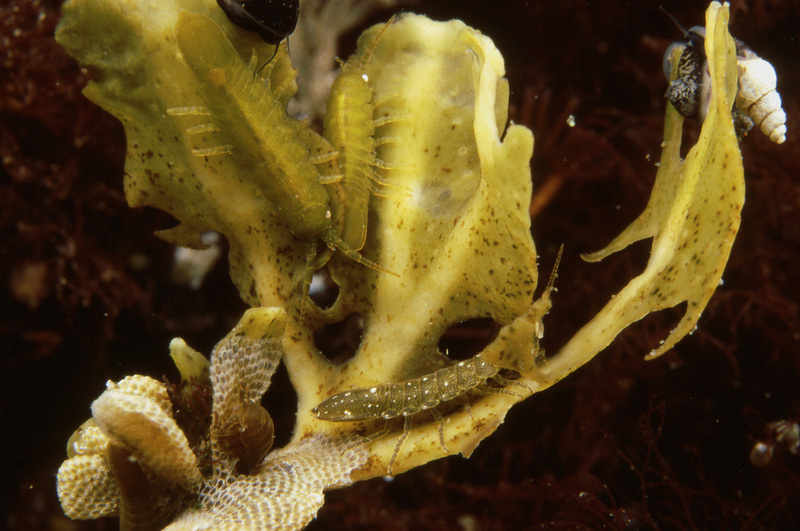 The color is almost invariably greenish yellow, resembling that of the wrack. 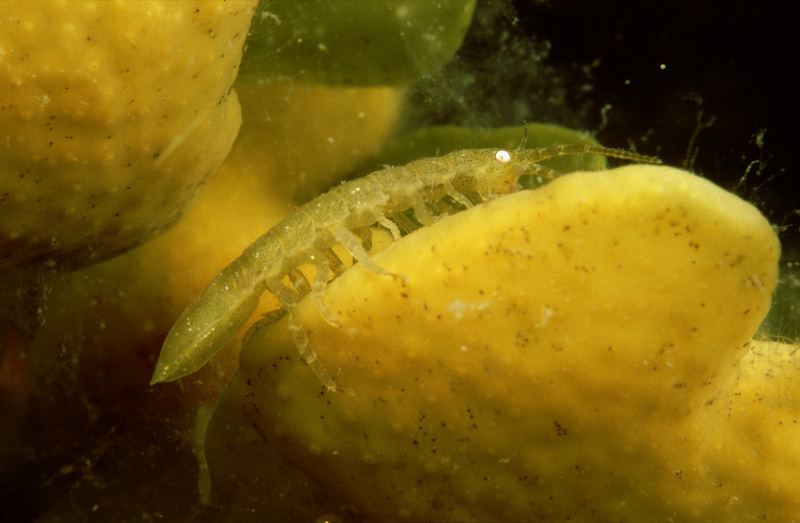 The abdomen of the species is narrower and more pointed. 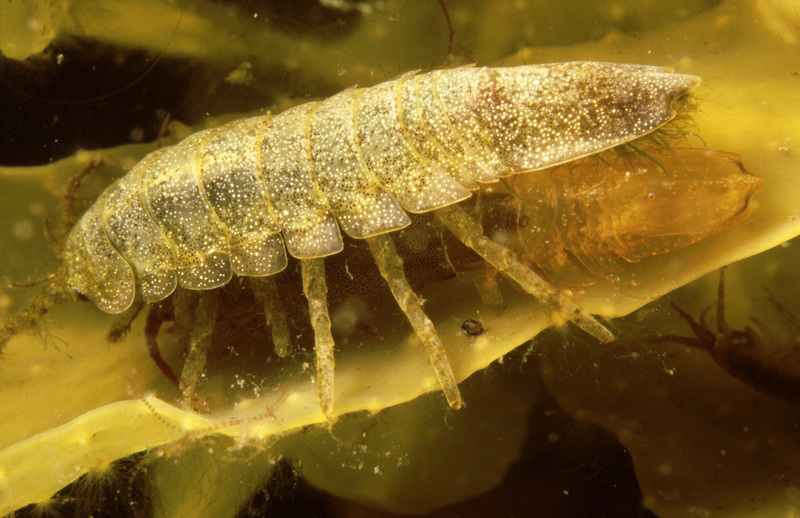 Idotea chelipes is referred to, in Finnish, as the skinny isopod, which nicely describes its body form in comparison with the other two. 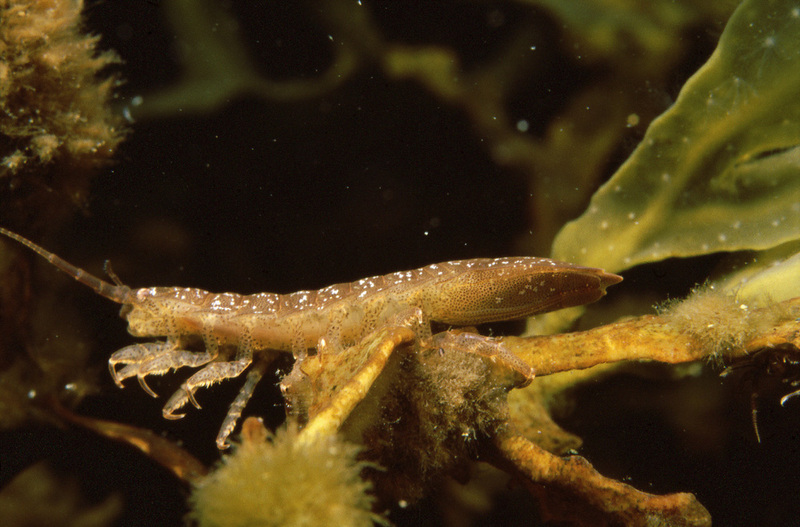 The skinnies prefer the more protected waters, as exemplified by these specimens on leaves of vascular plants, also species of the calmer parts of the archipelago. 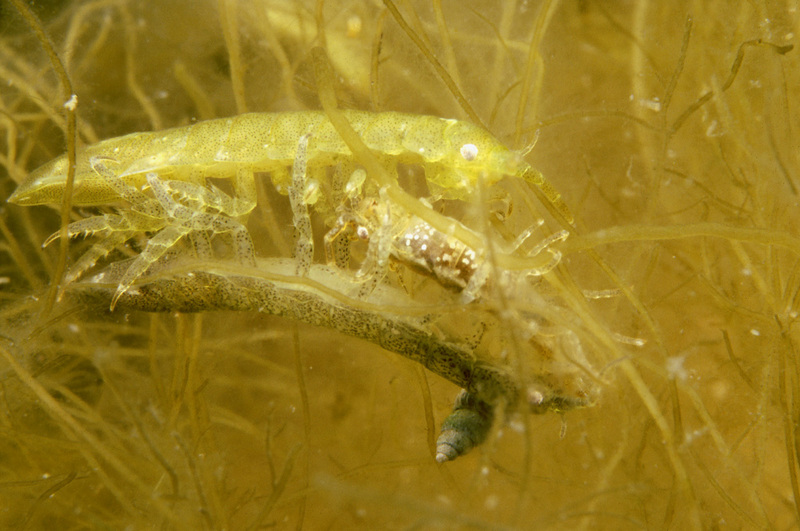 The mating rituals of the idoteas can include some actual wrestling between the males, like in the first photo here. 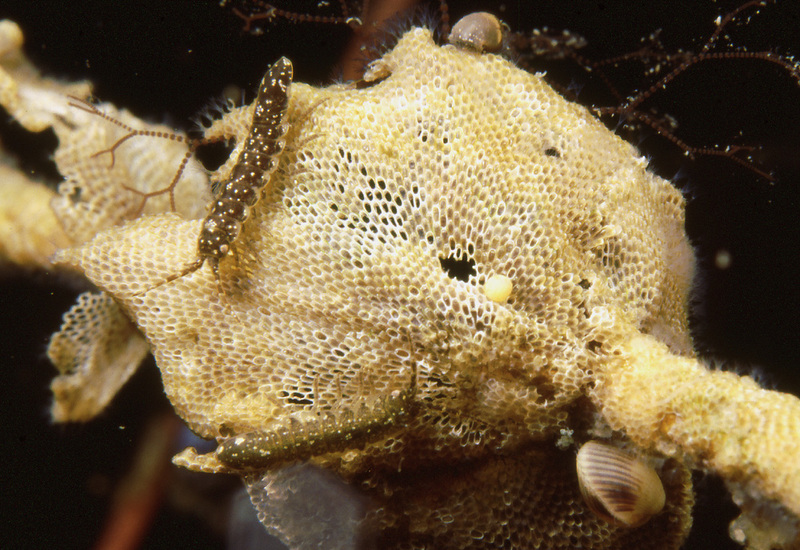 The idea for the male is to be the first one present when the molting of the female starts. 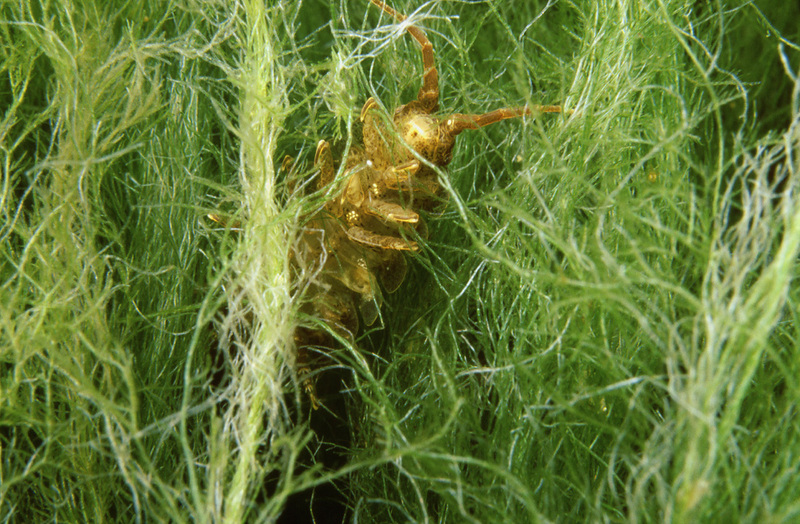 This will secure that the female has enough time to carry and care for the eggs before next molting. 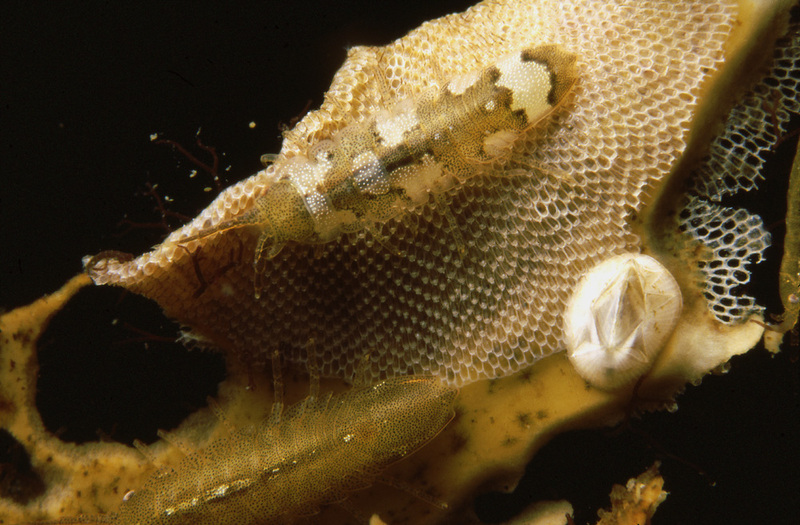 In the second photo the posterior section of the exoskeleton of the female (underneath and much smaller than the male) has already separated but is still visible behind her abdomen. 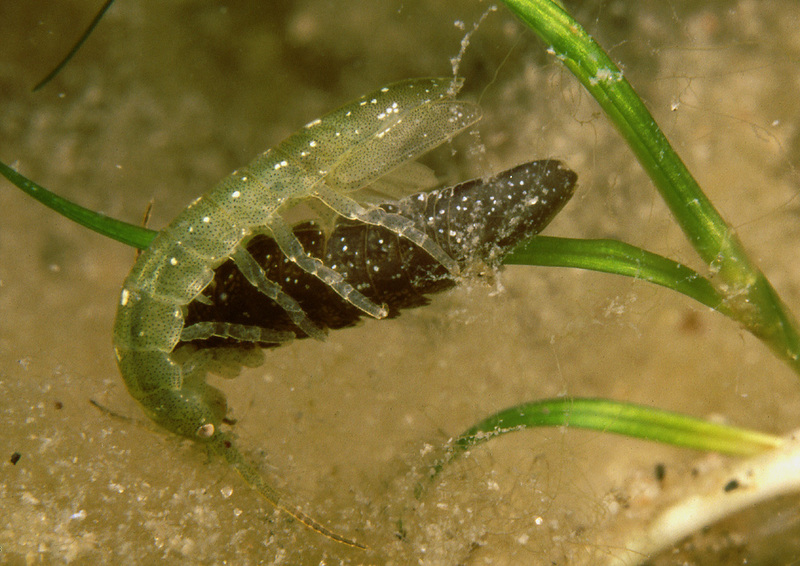 The third photo shows the orthodox position of a male in copulation, which actually means a transfer of sperm to the female, to be used later for fertilization. 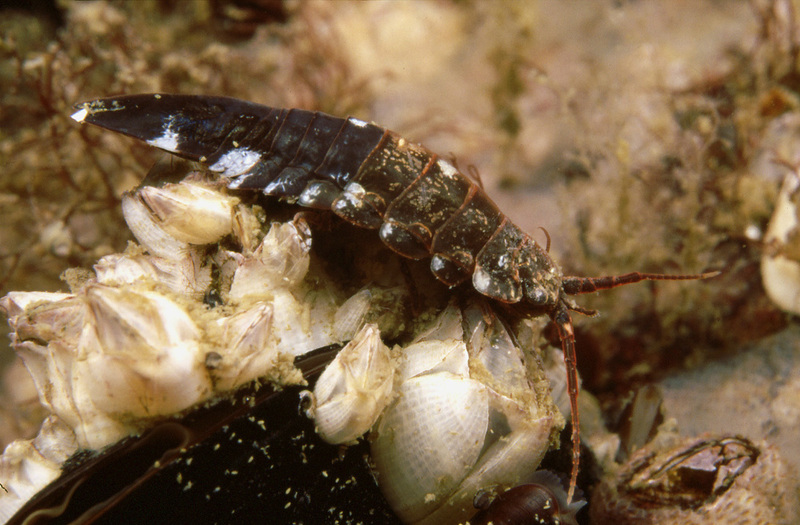 It’s not unique for crustaceans to have more than one mating period per season but in the colder climate and lower salinity of the northern Baltic proper it’s not as common as in the oceans. 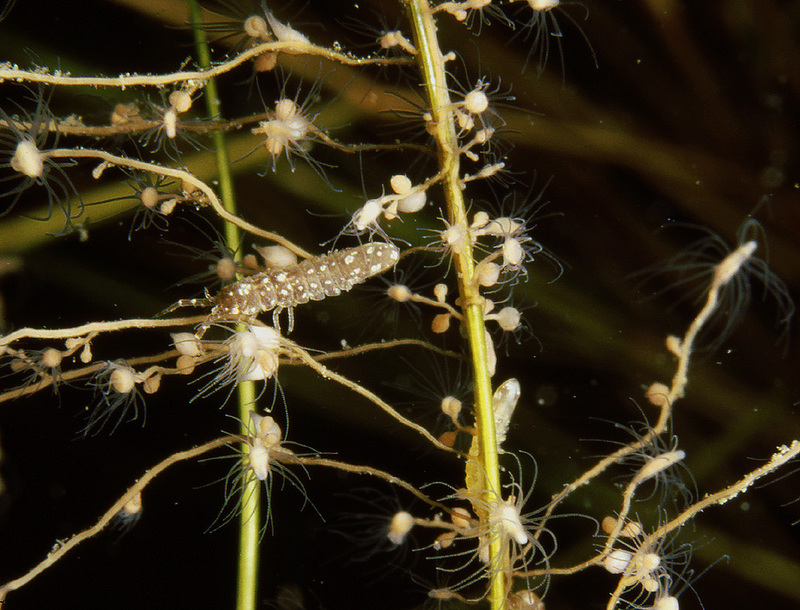 Here though, a young idotea is sitting on the backside of a male and watching the so-called precopula of the male and a female. 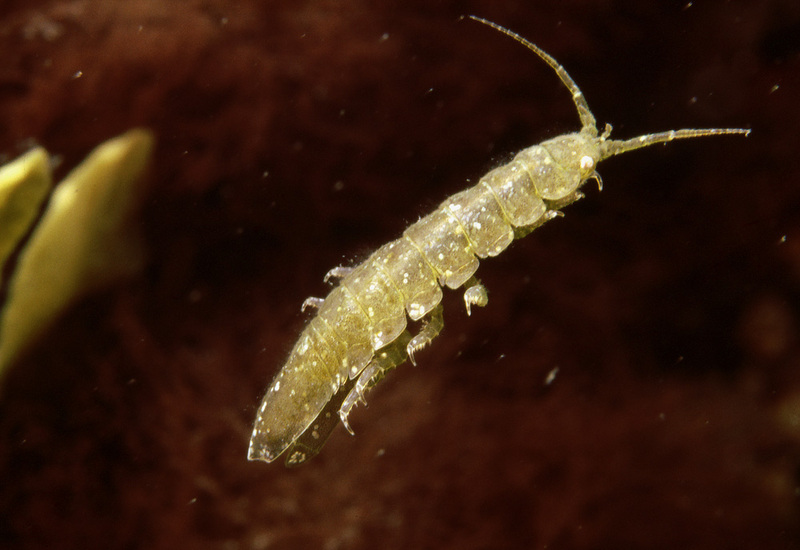 Since the juvenile must be an offspring of the summer, it’s a proof that there is a second yearly mating period for the idoteas even though it does not prove that another cohort (or age group) is actually produced.